Spigen, the iPhone accessory giant that has made a name for itself with it’s wide variety of quality and affordable smartphone cases has entered the electronics market. This was a bit of a surprise to some, but really shouldn’t be as Spigen has dabbled in things like Apple Watch stands and a battery bank with a built-in LED flashlight. Now they have stepped their game up a whole new level and launched their own Lighting-cable headphones (earbuds) on Amazon. We couldn’t find them on their website, but we did find this interesting contraption that turns your wireless Airpods into a more traditional looking cabled Bluetooth headset with a neck strap. But we digress. This article, this entire website, is about Lightning-cabled gear specifically for use with Lightning ports, and that what Spigens new earbuds are all about. They transmit a 24-bit digital audio signal with expected copper cords. 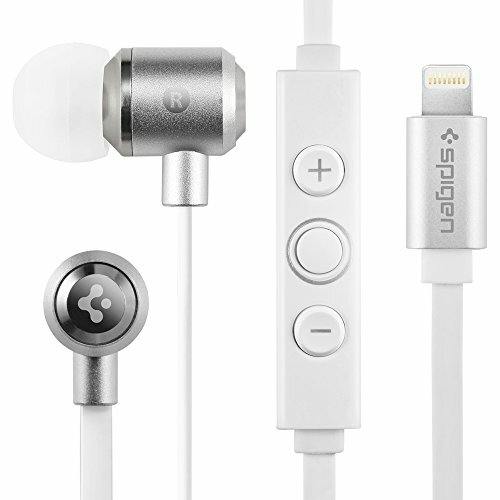 They connect via the standard 8-pin connector and are Apple MFi certified and can be used with iPhones, iPads and of course iPods (if anyone is still using those). No word on a microphone, but they do offer volume control. They also claim to amplify bass to enhance all genres. Hmm..
No word on frequency range, ohms, driver size or any of the usual information to be expected from high-end headsets, but at under $50, we wouldn’t call these high-end necessarily. Before going out and purchasing the Spigen Lightning earbuds however, take a look at the earbuds below offered form makers SHARKK and Brightech. Pay close attention not to the colors, but the design itself. Look closely at the construction of the driver unit, how they all tapper at the top the same way, feature the same cable-connector pice, same remote shape and controls, and same connector piece. Call us cynical but these all look to be pretty much the same to us. That isn’t necessarily a bad thing though, tons of OEMs produce things for a variety of companies how then brand things differently, that is globalization 101. The only thing we worry about is the actual quality, as the SHARKK and Brightech models haven’t had the most stellar reviews. Again, without getting our hands on these badboys we have to give Spigen the benefit of the doubt. Any readers out there, if you’re planning on picking up some Spigen Lightning earbuds let us know what you think about them in the comments below! If you are looking for a pair of Lightning earbuds that have had dozens of stellar reviews, we highly recommend you check out the JBL Reflect Awares, technophiles have been gushing over them for months now, and we can’t deny they’re innovative awesomeness.